Length: 8.1 miles Updated 7/14/15 Click on the icon in the text below for photos. Currently, there is no complete trail connection between Stephens State Park and Schooley’s Mountain County Park. However, with some road walking, Patriots’ Path hiking and a sense of adventure, thru and section hikers can hike from one park to the other. 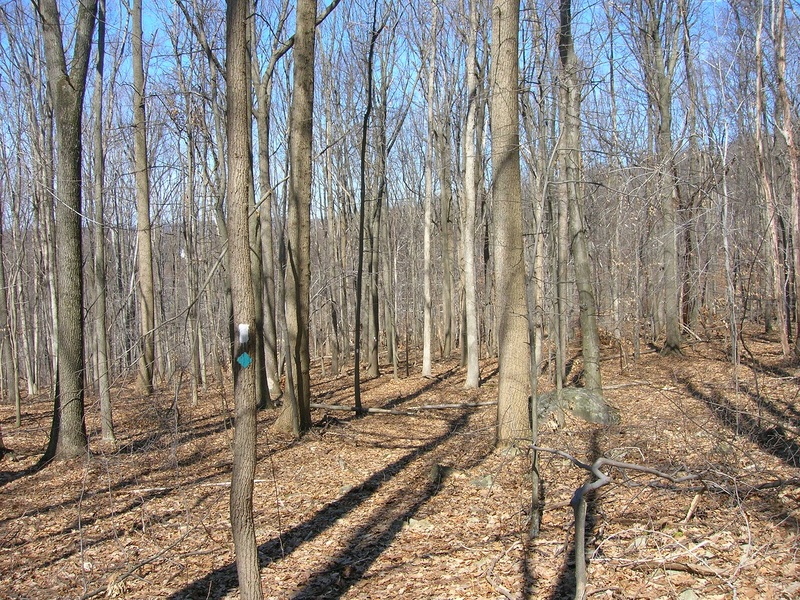 When completed between the parks, the Patriots’ Path will take the hiker down into Hackettstown and back up to the HT trailhead on Mine Hill Road at the back of Stephen’s State Park. This route will include some road walking. 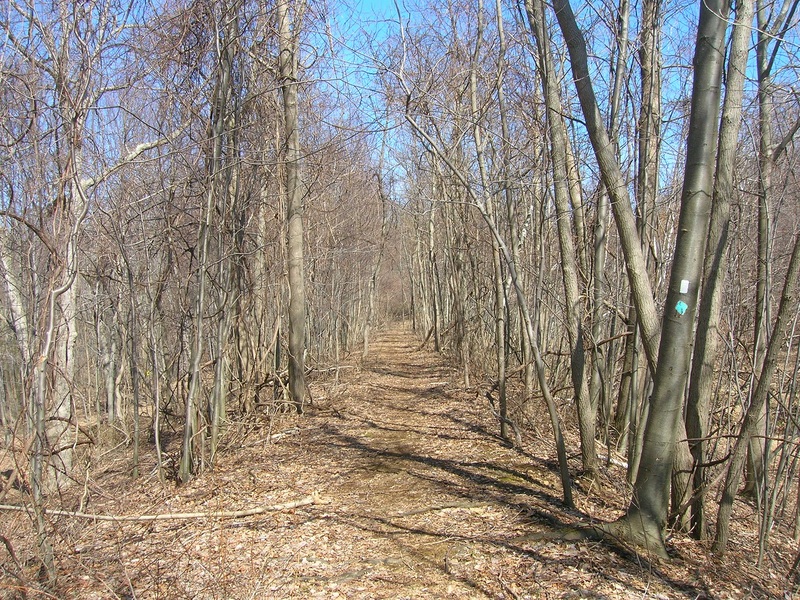 The 4.2 mile road walk portion described below is lightly blazed and mostly uses lightly traveled roads to connect trail heads. 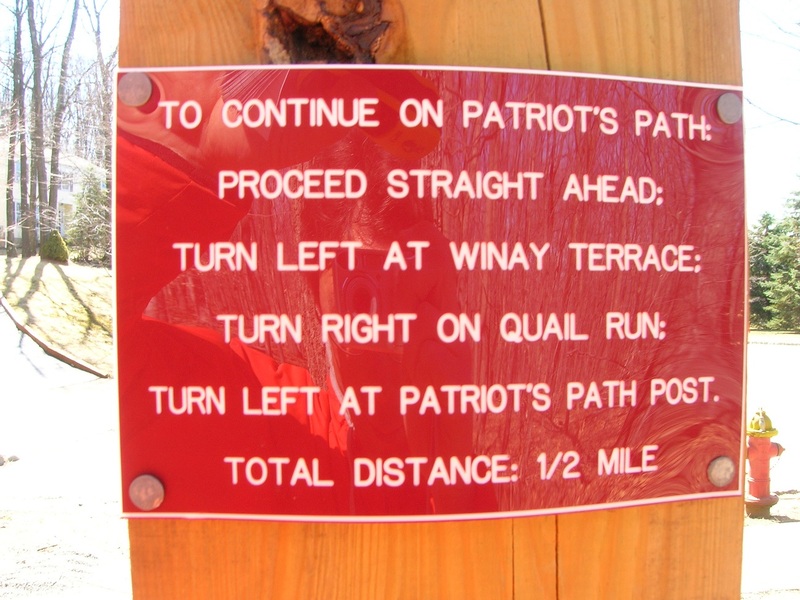 Turn left uphill on Mine Hill Road (the Patriots’ Path Blazes turn right), pass a gate at 0.2 miles, and come to Stephens Park Road at .9 miles. Turn right on Stephens Park Road and go .6 mile to a right turn onto Sand Shore Road at 1.5 miles. Cross Route 46 at the light in 1/2 mile (2 miles from Stephens), and continue straight ahead, now on Naughright Road. Follow Naughright Road .8 miles to a right turn on Mission Road. Follow Mission Road for 1.4 miles to a stop sign at the corner of Mission, Reservoir, and Spring Roads, 4.2 miles from Stephens State Park. Across Reservoir Road you will see a Patriots’ Path (PP) post near where the trail resumes. 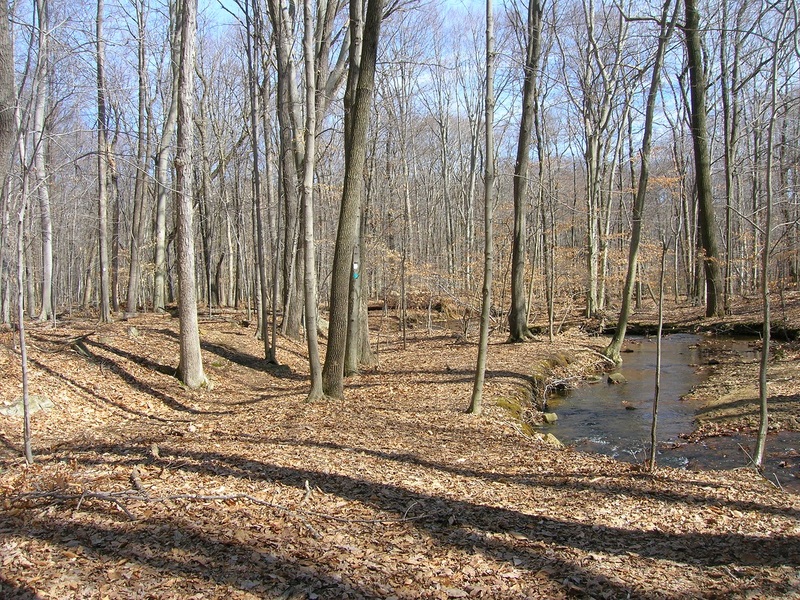 Follow the co-aligned Patriots’ Path (white) and Highlands Trail into the woods. Cross under power lines and continue uphill over wide switchbacks through woods and along what may be an old dam. At 1.2 miles from Reservoir Road 5.4 miles from Stephens you will come out in a neighborhood at the end of Sparrow Lane where you will see a PP post with directions for a short road walk. Follow Sparrow Lane .1 mile to the end and turn left uphill on Winay Terrace. Follow Winay Terrace .1 mile to the first right on Quail Run. Go about 100 feet on Quail Run to a left turn back onto the trail, which follows the power lines. Still under the power lines, cross straight over Hunter Road and shortly turn right off of the power line corridor. Pass through some brambly woods, come out to the edge of a school field, and follow the edge of the field out to Flocktown Road. You are now 2.2 miles from Reservoir Road and 6.4 miles from Stephens State Park. Here the Patriots’ Path route continues straight across a yard and through a narrow strip of woods between houses, but currently the HT follows a short, .5 mile road walk. Turn left onto Flocktown Road, then turn at the first right in about 100 feet onto Partridge Lane. Follow this down to the end of the road and cross over a low hill that has been planted with Blue Spruce trees into Harrington Park – a large park with sports fields. Turn left and follow the park entrance road out to Rock Road. Across Rock Road you will see a PP post, and the white blazes resume. Follow the trail .7 miles through level woods, mostly following pretty flowing streams. 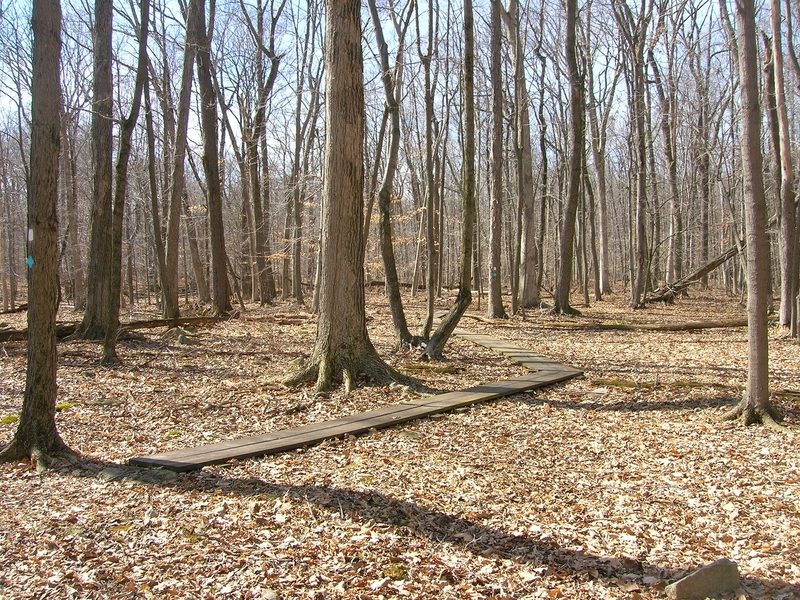 The trail crosses wet areas on planks and crosses the streams several times – sometimes on bridges and sometimes without bridges. You will come out to a small parking area on East Springtown Road 3.5 miles from Reservoir Road and 7.7 miles from Stephens State Park. Turn left across a small bridge on E Springtown Road, and then quickly turn right. The trail into Schooley’s Mountain Park begins on the right side of the road behind a small pump house. Follow the trail through fields, past the lower and upper parking lots, and the bathrooms, re-entering the woods 8.1 miles from Stephens State Park.